With just one question, two lives were forever changed. It’s the only instance when getting down on bended knee elicits tears of happiness. One person was nervous and sweaty. The other was full of bliss. Maybe it happened over Christmas, New Year’s or Valentine’s Day. Maybe it happened on a random day. All that really matters now is that one of your best friends is engaged and it’s your turn to transform a regular night out into an epic occasion of extreme proportions. There should be decorations, surprises, games, laughs and brag-worthy photos to frame and reminisce over. One that she’ll remember (or maybe not quite clearly but there will be Instagram proof to show it was!) as one of the best nights out with all of her closest friends. Period. No exceptions, no excuses. Feeling this weight on your shoulders and the added desire to ensure your bestie has nothing but a smile on her face is tough. Not everyone was born a party planner and the coordination, logistics and people pleasing can be really overwhelming. We totally get it. That’s why we’ve designed the perfect solution to dissolve any woes: The Bad Axe Throwing Bachelorette Party, also known as the most fun a group of girls can have together in one place. Sure we’re experts in all things sharp, steel, bladed, but we also happen to specialize in bachelorette parties. So how do we live up to this claim? Simple: we believe all brides deserve a night that’s next level and really takes fun to a whole new edge. Forget a day at the spa where treatments often take the bride away from her party and leave little room for getting rowdy. Forget Vegas where high expectations are often met with the next morning’s regret. Axe Throwing is where it’s at for a number of reasons. First, we’re local! Bad Axe Throwing has multiple locations across Canada and the U.S., which means there is bound to be a venue near you. That also means forgoing an expensive plane ride (maybe enjoying a quick road trip instead?) and supporting a local business. It’ll make you feel good. Secondly, axe throwing is affordable! There’s no need for extra cash to tip the half-naked male dancers (although our lumberjack-esque coaches are pretty muscular, they wear shirts at all times). We pride ourselves on making our price for the perfect party accessible. Once you book a bachelorette party with us, our dedicated staff will help with everything—from planning the big night to setting up the decorations. We’ll take care of the details so you can enjoy being in the moment with the bride-to-be! We also allow you to bring your own party food, drinks and cake. At each axe throwing station, there’s even a fridge to keep everything fresh. If you’d like to go with a local caterer, Bad Axe Throwing has a list of your city’s best local vendors and we’re more than happy to share it with you. Third, axe throwing is inclusive! And by that we mean EVERYONE can enjoy the thrill of throwing sharp blades at a target, all you need are arms. No matter what shape, size, height or athletic ability, it’s a sport for all. Even those bridesmaids or friends that may be hesitant at first will definitely loosen up after seeing the bride let her aggression from intense wedding planning out at the wooden target. Hehehehe best #bacheloretteparty idea ever! #badaxethrowing and #bigdan to start our adventures! Fourth, axe throwing is safe (with the tiniest amount of danger). While you are throwing sharp blades with your hands, you can rest assured that you’ll be in a completely controlled environment under the guidance of our expert coaches. They’ll show the girls the proper throwing technique, host games, a competition and keep the party going as long as you want. We promise there’s a greater risk of heading to the bar than enjoying a lively night of axe throwing. Lastly, axe throwing is fun AND different! It’s an activity that’s totally out of the ordinary, a great way to relieve stress and may see your bachelorette party bonding. You may even want to suggest the sport to the best man while he looks for unique bachelor party ideas and who knows, maybe the whole wedding party will want to enjoy an evening together! 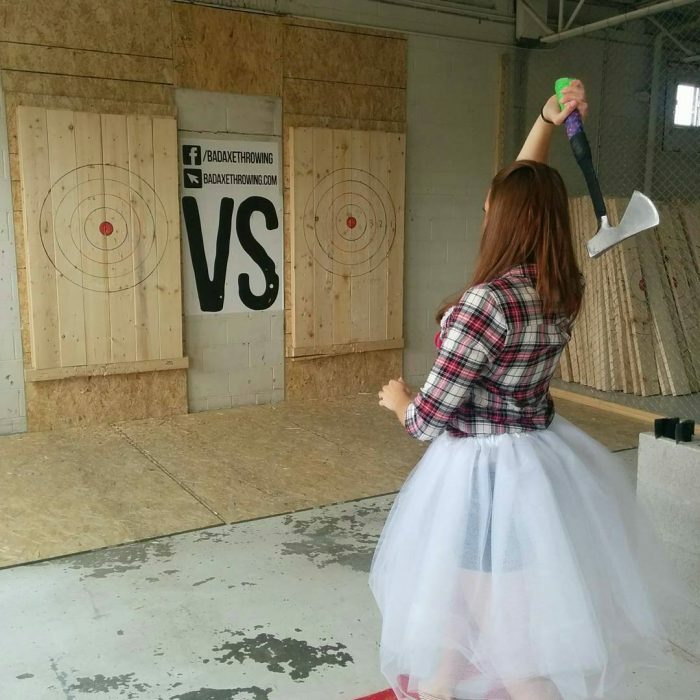 Before she takes the plunge, get her to step to the edge with an axe throwing bachelorette party. It’s really a no-brainer for a memorable night with the ladies.